Google launched its own physical security keys for two-factor authentication at its ongoing Google Cloud Next event day before yesterday, in an attempt to stop customer’s accounts from being hacked. Known as the Titan Security Key – a physical device – it works in a way similar to the products offered by companies like Yubico and it can be used to add an extra layer of security to protect data on the sites and services against phishing attacks. 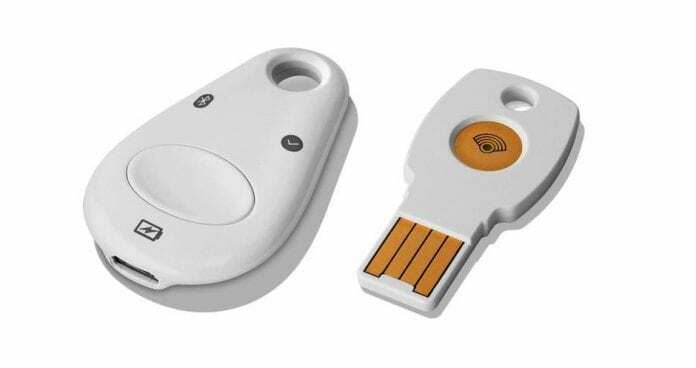 In 2017, Google started giving out physical security keys to all 85,000 employees to login accounts. Following this implementation, no employee has experienced any account hacks and phishing attacks since then. With the use of physical security keys, Google has removed the need for its employees to remember passwords or use one-time access codes. Google’s Titan Security Key, which is built on the FIDO specification, works just like other security keys and can be used over Bluetooth or USB. Titan Security Key can not only be used to secure the host of services offered by Google, but also with other non-Google services. The keys will ship in two separate variants: a USB version for desktop or laptop platforms, and a Bluetooth-compatible version for mobile devices. It will come in a bundle with both the USB and Bluetooth versions for $50, or you can buy one or the other for about $20 to $25 each. While the keys are now available for purchase to Google Cloud customers, they will be available for sale for regular customers in Google Store within the next few months, the search giant said. I’ve had a FIDO device for over 3 years, so this is not exactly news. We all know nothing is really hacker-proof, but having this device helps to put your mind more at ease. I originally used it just for my Password Manager, but now I use it on several sites, including Google.